The story of Jonah and the Whale fascinates children. This colorful tale combines adventure, ocean life, and Biblical concepts such as repentance and obedience. Using craft projects to further illustrate the points of the story is a great way to round out a successful lesson plan. Cut a large fish shape out of construction paper and use sequins to add texture and create the look of scales. 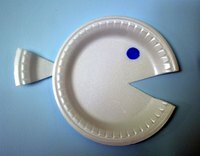 Create a simple whale by cutting out a triangular wedge in a paper plate that is about 2 inches at its widest point. This will form the mouth of the whale. Attach the wedge at its smallest point directly across from the mouth to represent the whale's tail. Add craft eyes and decorate with crayons or markers. Go to websites such as akidsheart.com for downloadable coloring pages. Create an origami whale by folding a triangular piece of construction paper into a kite shape, folding the kite shape in half and then folding the narrow end over to represent the whale's tale. Mold a whale out of modeling clay for a more three-dimensional craft. The easiest way to create a clay whale is to roll the clay out into a thick log shape, pinch and flatten one end of the log and hollow out a mouth on the other end. Or stuff an ordinary lunch bag half way with newspaper. Gather the upper part of the bag with a twist tie to form the whale's tail. Draw the whale's face on the bottom of the sack and add construction paper flippers to the whale's belly. Prepared craft kits can save time. You can find a craft foam Jonah and the Whale kit at orientaltrading.com. Using recycled materials can cut down on the cost of craft supplies. Create an ocean in a bottle by combining mineral oil and blue food coloring along with an equal amount of water in a clear plastic bottle. Turn the bottle on its side and move back and forth. The colored oil will separate from the water and give the impression of a rolling ocean tide. Transform an old CD into a shimmery fish; use the CD as a body for the fish, and add craft foam lips, fin and tail. Place a coffee filter on a paper plate and flatten out. Color with crayons and then sprinkle with water. The colors will bleed and take on a variegated appearance. Cut out the shape of a fish when the filter is dry. Embellish with craft eyes and strips of foil or shiny ribbon. An empty milk jug can also make an interesting whale simply by cutting away the bottom to create a mouth and decorating with markers.